He started by showing us a series of logos, and asked us if we recognized them. The entire audience did — they were universally identifiable. Then Ersin showed us six different kinds of leaves, and only a handful of people recognized them. His point was embarrassingly clear. Society has become focused on saving the planet, but we can’t even name a handful of leaves. 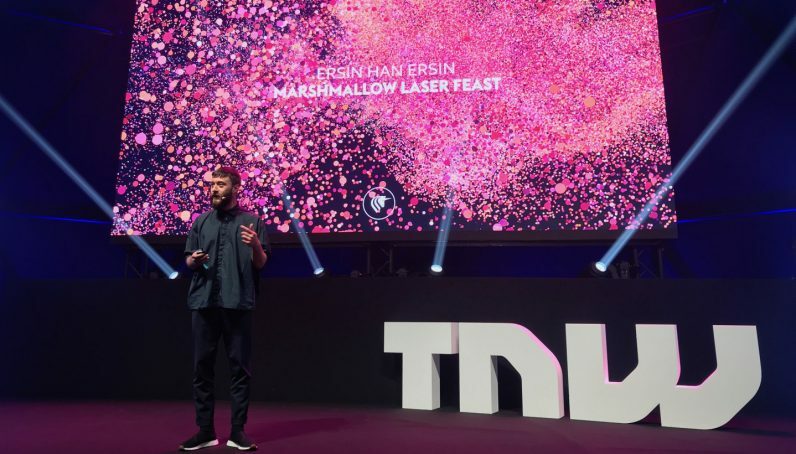 So Ersin and his Marshmallow Laser Feast team set out to change that, using virtual reality in nature. “It sounds like an oxymoron,” Ersin tells the audience. Indeed, it does — how can technology heighten our connection to nature? The answer lies in the term umwelt. The Marshmallow Laser Feast team began by 3D mapping the Grizedale Forest, in England’s Lake District. They were fascinated by its beauty, and came up with the idea of showcasing the forest from the perspectives of the animals that live there — this is known as umwelt. Seeing a forest through the eyes of a frog or a mosquito is fascinating. Ersin explains how female mosquitoes see carbon dioxide, which is how they identify their next victim. Dragonflies see the full spectrum of light, and so their view of the same forest would be completely different. But how does that look? Using 360-degree Lidar scanning, they formed a digital map of the landscape. Then, they manipulated it to show how different animals would be viewing the surroundings. Senses were extremely important in this project. Participants felt the forest floor beneath their feet, smelled the damp soil, and heard the rustling of leaves. These components heightened the overall experience by making it more immersive. Ersin also explains how technology created the sensations we couldn’t feel on our own. “How do you translate the sensation of a frog ribbiting into human senses?” Ersin asked us. The answer is through a backpack that imitates the sound waves, letting you feel the ribbits, and the beating of wings as a dragonfly. Participants wore these during their 15-minute experience. The audience at TNW Conference was completely fascinated by In the Eyes of the Animal. It’s a blend between art and VR, and has positive impacts on how we connect with nature. If you’re interested, Marshmallow Laser Feast has some other cool VR projects. Ersin spoke about their project Tree Hugger, where you follow a drop of water as it’s absorbed by a tree.